When you’re travelling around the UK and spending hundreds of pounds on train tickets, you expect a good rail service. You expect trains to arrive on time and no unexplained cancellations. Unfortunately, for many travellers it has become something of a rarity to see the 5.34pm train from London to Birmingham arrive on time… if it even arrives at all! An alternative for train travellers in the UK has been created to solve the on-going travel mess. Although coach travel may not be the most fashionable way to get around it definitely has become one of the cheapest. 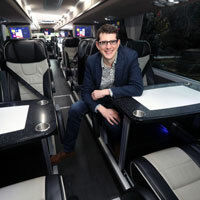 To this end a technology platform has been introduced offering a coach service that matches people who want to make similar trips up and down the country for the cheapest possible fare. Thomas Ableman, CEO of Sn-ap, described his idea as, “a real light bulb moment”. In July 2015, he took the idea to his boss at the time who straight away agreed to put money into his idea and the rest is history. After months of evenings and weekends working on the project, the potential behind the idea became clear to Ableman, so he left his job in January 2016. He then went on to recruit a core founding team which then came together in July 2016 when they launched their first microscale MVP (Minimum Viable Product). Once this was in place, everything moved quite quickly for Sn-ap. The initial hurdle faced was raising funds, and the company first managed to raise £2.4m through angel investors, £1m through Kindred Capital, £2m through ADV and a further £1m through Oxford Capital. The website is easy to use and allows customers to tap in their departure and arrival destinations, and date and time, which then generates a list of confirmed journeys. Once booked onto the journey, a conformation email is sent to their inbox as well as an email reminder before the journey. For each journey made the company use forecasting, pricing and rating algorithms. The algorithms help predict when the most popular journeys will be, what destinations are requested and from this data it arranges journeys to fit with the customer. The platform also allows customers to request a specific journey and if there’s enough demand for their requested trip, Sn-ap put it on for them. Sn-ap arrange pick up and drop off points that work for the customers on any specific journey. The customers can also book and manage their journey on any device and track the coach in real time. The company offer a price match guarantee service that allows you to try and find an un-discounted, equivalent trip for less than you paid for your Sn-ap trip, and if successful, they will refund you the difference. Sn-ap is a new 'on-demand' coach service.